City-Link Express takes pride for being a home-grown courier service company which has more than 30 years of history. Since its humble beginning, the company has evolved among one of the leaders in the local courier market front. City-Link is recognized being a pioneer in the introduction of bar-coded consignment notes, infusing the latest Information Technology to its own purpose-built head office with warehousing facilities. This clearly gives an indication of the vision of the entire City-Link Group. City-Link is the only Malaysian courier company that spreads its wings to the international front. With offices in Singapore, Indonesia, Thailand, Cambodia, Vietnam, China and Taiwan, the Company has position itself as a regional courier service provider. Such presence enable the formation of strategic alliances with counterparts in India, Pakistan, Korea, Sri Lanka, Japan, Australia, UK, USA and Canada. The alliances are continuously growing, adding on further City-Link's service coverage areas. 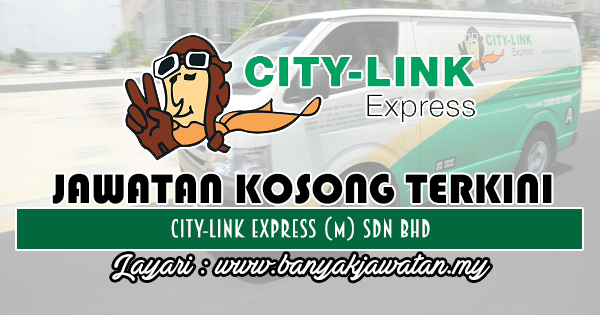 1 Response to "Jawatan Kosong di City-Link Express (M) Sdn Bhd - 23 Ogos 2018"
Jawatan kosong office boy di bintulu ada lagi tak ? ?